Read the lastest e-newsletter on Connective Corridor greenscapes here. Through a partnership with Onondaga County’s Save the Rain Program, the Connective Corridor is one of the most extensive urban networks of green infrastructure in the country, and a model for its use of such a wide expanse of technologies in a complete green streetscape. Partnership with City and County economic development on urban in-fill, fostering principles of smart growth. The Connective Corridor is proud to have been recognized by the U.S. Green Building Council with its Global Leadership Award at the 2012 international Greenbuild Conference. The award honored the collaboration behind the Connective Corridor as a global model for sustainability, urban design and green building. Read more here and see the award video here. 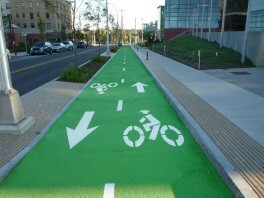 The Connective Corridor is also the recipient of the 2015 U.S. Department of Transportation – Federal Highway Administration Environmental Excellence Award, recognizing the collaborative partnership for its commitment to developing and building a sustainable complete streetscape that is considered a model for other communities. Green infrastructure elements of the Connective Corridor were generously funded by Save the Rain. Along with more than 4,000 plantings of shrubs and perennials and 285 new trees, a wide array of geogrids, silva cells, catch basins and rain gardens were also installed. 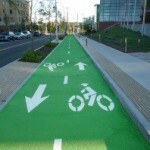 The Connective Corridor is essentially a new urban greenway. There are 27 species of trees planted along the route – including maple, birch, sycamore, oak, honey locust and elm, as well as flowering varieties such as pear and cherry. The green bags at the bases are part of a GI water management system to ensure the trees stay hydrated and healthy. Water must be applied slowly to prevent runoff and adequately penetrate the soil, so those tree bags help with slow watering to help better establish the trees. The tree pits are green too. They are Flexi®-Pave porous pavement set with Gravel-Lok durable, eco-friendly permeable aggregate bond. These measures are designed to absorb rainwater from impervious areas such as roofs, driveways and walkways, reducing runoff by allowing stormwater to soak into the ground, as opposed to flowing into storm drains and surface waters, which can cause erosion, water pollution, flooding, and diminished groundwater.Combined Connective Corridor green infrastructure projects prevent 26 million gallons of stormwater from entering the sewer system each year, and create an equally significant impact in terms of harvesting and managing an increasingly critical natural resource – water itself. Increased tree plantings that reduce the heat island effect, improve air quality and offset CO2, and widened sidewalks that make the streets friendlier to pedestrians.